Yep, the season is here and I'm ready to deck. those. halls. Each year, I lean more and more towards minimal Christmas decorations and I love simple black and white with splashes of metallics. I'm a huge fan of a banner or pendent. They are easy to hang and roll up small and compact to pack away for the rest of the year. Banners add a relaxed, informal vibe to a space. 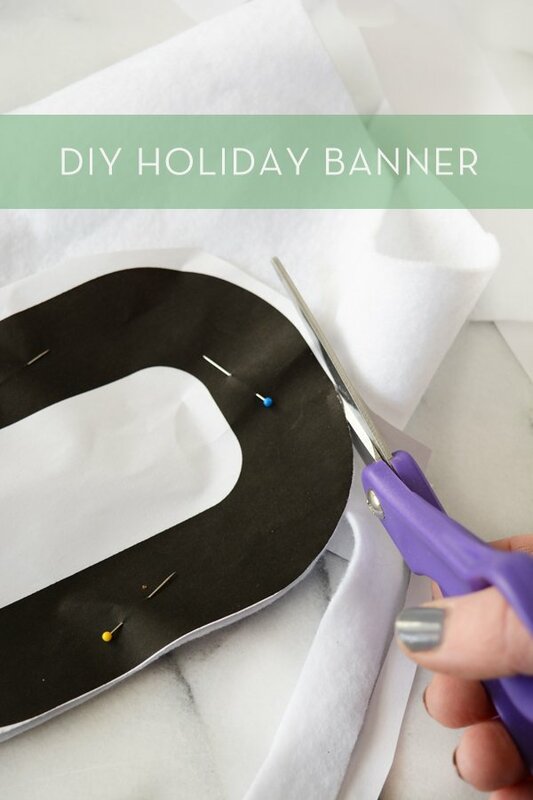 This no-sew, narrow NOEL banner is perfect for a tight space. I'm hanging mine on a tiny space on my wall between the door and window. Felt is one of my favorite materials to work with. It's inexpensive and requires no sewing. One of the things we look forward to most come summertime are visits to our local beach. Lying back on a towel with our toes in the warm sand and the sound of waves in the background is pure bliss. But once we head to the water for a dip and emerge from the ocean to stroll back to our towels, we often find ourselves looking around in confusion because our little bundle of belongings looks just like every other bundle on the beach! Well no more. I've decided the easiest way to easily identify our stuff is to make sure it looks different to everyone else's, and I think this bright watermelon and popsicle combo might just do the trick! There may still be snow on the ground in some places (I’m looking at you, Boston), but spring will be here before you know it. And that means -- patio season! New England winters have trained me to take advantage of every available moment of spring and summer weather, so I am always looking for easy ways to make my tiny driveway patio cuter. That’s where these DIY Mud Cloth Paper Lanterns come in. They’re on-trend, inexpensive, and wicked easy. Keep reading to see how to make them for yourself! Before we know it, Easter will be upon us... which means that it's high time to get some Easter eggs in a basket! (Or in this case, a white tray). Today we're sharing a quick and easy way to decorate eggs using spray paint and few adhesive stickers. Click through to check out the full tutorial. I'm a pillow hoarder, so it's probably no surprise that I always have extra pillow covers in the house. I swap out my pillows every time I get sick of something, and because purchasing new pillows all the time is an expensive hobby, I've found a surefire way to personalize any pillow with my own designs using inexpensive IKEA pillow covers! The secret: sticker paper and paint. DIY may not be an official Scrabble word, but for this DIY planter project, it’s a total game-winner. I can't get enough of Scandinavian design, and I'm on the hunt for ways to bring this style into my home. The decor in my house hasn't had a theme until very recently (unless you consider furniture inherited from past roommates a theme). Now that I'm almost 30 (panicked bells ringing as I type that), the items in my home are brought in with more intention. I love all things monochromatic, so the Scandinavian look fits my mostly-gray furniture perfectly. This dining table needed a new tablecloth, and the Scandinavian-inspried Swiss cross pattern seemed the perfect fit. Happy New Year! What better way to kickstart 2017 than focusing ahead on positive and encouraging words that anyone can live by? I'm not big on resolutions (even though I still make them year after year), because I feel I usually end up just setting myself up for failure. So instead, I'm focusing on new ways of looking at the day to day. These ten quotes will be sure to start any day on the right foot and remind you to just smile and enjoy this new year, one day at a time. Best part is, you can download these free printables to place anywhere you need some extra motivation. 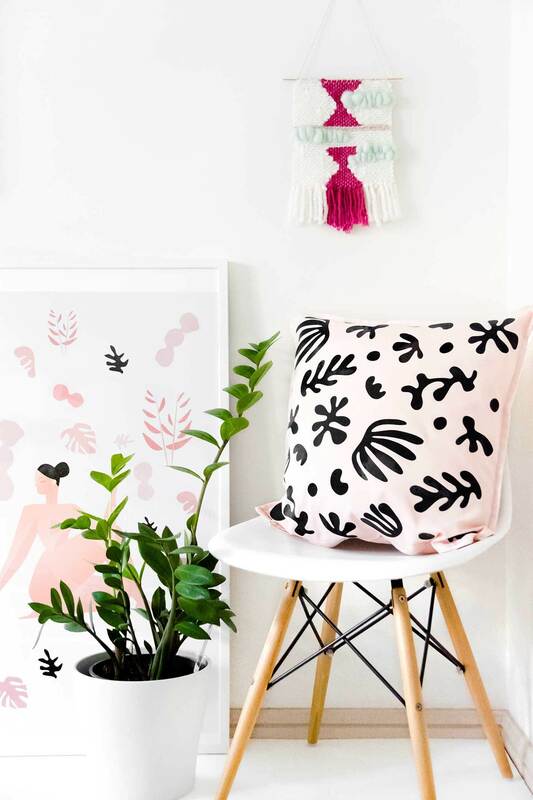 Pillows are the best way to change up a room for the new season. And nothing is more cuddly and warm then a soft flannel shirt. This fun flannel pillow is sure to encourage some quality time on the sofa. Vintage prints of animals and specimens definitely have a Halloween vibe so I decided, for my decor this year, to do a simple DIY using free vintage prints I found online. This post has the instructions on how to do this simple DIY project and a roundup of some sweet vintage Halloween prints for you to download and use. Hello again everyone! I'm back today sharing something I'm really passionate about: printables! I work all day as a Creative Director, but I'll always be a Graphic Designer at heart. Creating beautiful images is one of my favorite past times, and sharing them brings me a lot of joy. I feel like Shibori is here to stay. While it's easy to just assemble rubberbands and work the dye, there are different techniques you can use to repeatedly achieve different patterns. And it's easier than you think! I know I say this a lot (I think I've mentioned it at least two times on Curbly before), but that's only because it's true; wall art is SO easy to DIY that there's really no excuse not to have a go at making your own. I don't like doing garage sales by myself. If I am going to be sitting outside for hours I want to be there with my friends. Multi-family sales attract more people which means you have a better chance of selling stuff, yet they do require some serious planning and organization. Here are some printables, and a few helpful tips, that can help you pull off a successful multi-family garage sale. I've always loved Scandinavian prints. They manage to be both sophisticated and fun at the same time, and they combine so many of my favourite things; bold colours, plenty of patterns, playful shapes... what's not to love? So when I needed a little something to brighten up my bare walls, a Scandi-inspired wall hanging was the first thing that came to mind. Click through to make one of your own! You don't need to spend an arm and a leg for fancy art. And if you go the DIY route, you don't need to spend a ridiculous amount of time or effort. These botanical prints look like they couldn't be easier to make! I'm sure by now we've all seen potato stamping, but for me, this is the first time I've ever seen it done so beautifully. There's something about the monochromic color scheme and repeating pattern that makes these pieces feel so modern, clean and new. If your walls are in need of new art, grab the supplies from your kitchen and get to stamping! The possibilities of what you can do are endless.